Hearthstone is about to undergo its biggest shakeup since launch. This spring a new format called ‘Standard’ will go live alongside the release a new currently unnamed card expansion. You can read the official blog post here, but the crucial change is that in Standard players can only use cards released in the current and previous calendar year, plus the Basic and Classic sets. That means cards from expansions released prior to 2015—i.e. Curse of Naxxramas and Goblins vs Gnomes—will be ineligible for deckbuilding in the Standard format when it arrives (exact date TBC). However, before anyone dusts their Golden Dr Boom, note that the current way of playing Hearthstone isn’t going away. The version of the game we play now, with no restrictions on card eligibility, is being renamed as ‘Wild’. In both the ‘Wild’ and ‘Standard’ formats there will be a casual mode and a ranked ladder where you can earn rewards at the end of the season, including the coveted Legend card back. So, if you don’t like the sound of Standard, you can keep playing your current deck in Wild. Arena will continue to operate using the Wild card pool. As the name suggests, though, Standard is what Blizzard is going to be focusing on in terms of competitive play, and only the Standard ladder and Standard tournaments will award points for the World Championship. Obviously the impact on the metagame and competitive scene is going to be immense. We’ve got a gallery of the 20 most powerful cards that are going away in Standard here. Two of Paladin's strongest cards will be unusable in Standard. Simultaneously removing two sets whilst adding a new one is going to lead to substantial reworks of many of the many of the most popular decks. Consider that the most dominant deck on ladder right now is Secret Paladin. Overnight it will be without Avenge, Shielded Minibot, Muster for Battle, Piloted Shredder and Haunted Creeper, not to mention the good doctor. The Mech archetype will also effectively be wiped out, and Warrior’s will wake up in a post-Death’s Bite world. No doubt all of that will come as a shock to players who’ve come to rely on those cards, but for the long-term health of the game, it’s easy to see why Blizzard is going down this route. Rotating sets out of play is something Magic The Gathering has done for a long time, and removing ubiquitous cards like Sludge Belcher from Standard Hearthstone will free up design space for Blizzard to create new cards at the same mana cost. You can read the full interview here, in which he explains why he believes that without a change of this magnitude the game’s long-term future would have been in doubt. Brode also told me that future balance changes will be based on what's happening in Standard rather than Wild, which is inevitably going to become something of a free-for-all as the collection continues to expand. On the subject of balancing, Blizzard will be addressing some of the more problematic basic and classic cards to ensure they don’t have a negative impact on the Standard metagame. Again, there are no details on which cards are being looked at, but I was told that less than 20 will be nerfed and none will be buffed. Perhaps we’re about to see the end of the Druid combo after all. Change on this scale is invariably greeted with complaint, so to sugar the pill Blizzard is addressing one of the community’s most long-standing complaints: the lack of deck slots. When the Standard format launches, the number of deck slots will be doubled to 18. When the switch over happens, players will no longer be able to purchase the retired ‘Adventure’ modes. At that point, however, they will be able to craft those cards using arcane dust, though they’ll only be playable in Wild. The Curse of Naxxramas adventure will no longer be available to purchase. 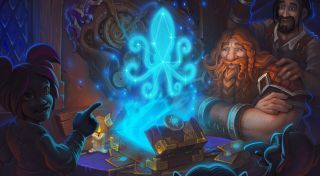 Assuming it’s a success, this set rotation process will be repeated annually, with each Standard year named after a sign of the Hearthstone zodiac—beginning with the year of the Kraken. When that ends in spring 2017, all of the sets that were released in 2015 will exit the Standard card pool, meaning it’ll be sayonara to Blackrock Mountain, The Grand Tournament and The League of Explorers. PC Gamer was first made aware of Blizzard’s plans to begin rotating old expansions out of the game late last year, under conditions of confidentiality. Though initially startled by the scale of the change being talked about, it was clear that the game needed to do something drastic structurally to keep it fresh. Tellingly, Hearthstone’s last major card expansion, The Grand Tournament, was criticised for making too little impact on the metagame, with comparatively few of the new cards making it into top tier decks. The more recent League Of Explorers adventure fared much better, and was praised for its innovative Discover mechanic and exciting new Legendary cards like Reno Jackson. Nonetheless, as the card collection continued to grow, something was always going to have to give to avoid power creep or stagnancy. Standard seems like an elegant solution, which will no doubt be helped by the excitement that always accompanies a new set. Let us know what you make of the change in the comments below, and we’ll have more analysis to come on the PC Gamer Pro channel. For now, let’s enjoy watching the Hearthstone scene react in its usual calm, considered manner.